After three years of working as partners in introducing the biotech yeast trademarked TransFerm to the ethanol market, Lallemand Inc. has purchased the yeast development business from Mascoma Corp.
USDA is still projecting a record corn crop, but just not quite as big, reducing its forecast by 68 million bushels in the Nov. 10 World Agricultural Supply and Demand Estimates. Corn production is now forecast at a record 14.407 billion bushels. Archer Daniels Midland Co. reported good overall financial results for the third quarter, which ended Sept. 30, including significant improvements in corn processing. In fact, profit in this segment nearly doubled, reaching $356 million. DuPont recently released third quarter financial results, reporting a 20 percent increase in operating earnings per share. The company's Industrial Biosciences segment experienced a 4 percent increase in operating earnings for the quarter. Valero Energy Corp.'s ethanol segment reported a record third quarter operating income of $198 million, compared to $113 million recorded in the third quarter of 2013. The good segment results were the result of a 27 cent per gallon margin increase. The ethanol group at The Andersons Inc. led the company's third quarter earnings report with record Q3 operating income of $21.3 million. Overall, the company's year-to-date earnings set a new record at $2.95 per diluted share. Aemetis Inc. has announced plans to establish a facility to produce liquefied carbon dioxide adjacent to its 55 MMgy ethanol plant in Keyes, California. The U.S. Energy Information Administration has published updated ethanol plant production capacity data. As of Jan. 1, 2014, the EIA reports the U.S. was home to 187 operating fuel ethanol plants with a combined 13.68 billion gallons of capacity. Growth Energy participated in a market development mission with the U.S. Grains Council and the Renewable Fuels Association to explore export opportunities for U.S. ethanol in Panama and Peru. Missions are also planned to countries in Southeast Asia. The Renewable Fuels Association has submitted comments to the Oregon Department of Environmental Quality detailing a number of requested changes to the proposed rule for Phase 2 of the Oregon Clean Fuels Program. The National Pork Board and the National Corn Growers Association haven't always seen eye to eye. Now, Chris Novak, a past CEO of the pork board is CEO of the NCGA. Class I railroads have filed their third weekly status reports with the Surface Transportation Board. The reports provide an overview of operational performance for the week beginning Oct. 26. The Renewable Fuels Association's Director of Regulatory Affairs, Kelly Davis, was formally appointed to the Department of Commerce's Renewable Energy and Energy Efficiency Advisory Committee. The Renewable Fuels Association and the Renewable Fuels Foundation are partnering to offer interested students the opportunity to attend the 20th anniversary of the National Ethanol Conference in Grapevine, Texas, on Feb. 18-20. University, state, and industry officials came together on Oct. 22 to celebrate the announcement of the Integrated Bioprocessing Research Laboratory, a unique facility coming to the University of Illinois campus. By manipulating a plant's metabolic pathways, two scientists at Lawrence Berkeley National Laboratory have figured out a way to genetically rewire plants to allow for an exceptionally high level of control over the spatial pattern of gene expression. The growing movement to call out the U.S. EPA for its ethanol emissions testing procedures picked up support today as a new study from the Society of Automotive Engineers called the agency's approach flawed. A public comment period on the Oregon Clean Fuels Program is set to end Nov. 7. The program, which is similar to California's Low Carbon Fuels Standard, requires a 10 percent reduction of greenhouse gases from transportation fuels by 2025. Solenis has received a U.S. patent for the use of chemical additives to improve the separation of corn oil in the ethanol production process. The company first filed a provisional U.S. patent in March 2011 and was issued the final patent Sept. 23. A Renewable Fuels Association analysis of model year (MY) 2015 warranty statements and owner's manuals reveals that auto manufacturers explicitly approve the use of E15 in approximately two-thirds of new vehicles. 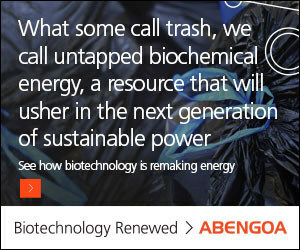 Scientists at the University of Wisconsin-Madison have disclosed a new method to convert lignin into simple chemicals. The innovation is an important step toward replacing petroleum-based fuels and chemicals with biorenewable materials.